Sugar and The Mint is a vibrant young contemporary bluegrass band, and the winner of the prestigious Telluride Bluegrass Festival Band Contest in 2017. The band’s album debut show at The Elks Theater on May 19th kicks off their Just Past Midnight summer tour, in which they will travel through Arizona, Utah and Colorado, to Telluride’s 2018 Bluegrass Festival, where they will share the stage with Emmylou Harris, Jerry Douglas, Bela Fleck, Chris Thile and many more musical legends. Sugar & The Mint’s brand-new album, Just Past Midnight, is out May 19th. It will feature several new original songs, along with a reimagining of Bruce Springsteen’s Born to Run, and will showcase the group’s inimitable musical perspective and technical prowess. Between How Far, a tale of toxic love, Overland Drive, a beautiful and tender folk ballad, and Thumper, a toe-tapping bluegrass instrumental, there will be much for any music fan to appreciate. Sugar & the Mint got its start with The Sharlot Hall Museum in Prescott, Arizona in February 2011. Students were, initially, chosen by audition and formed as a youth cultural music conservatory group (at the time called Generation). In 2014, Sugar and the Mint (Generation) parted ways with Sharlot Hall Museum and ventured out on its own. 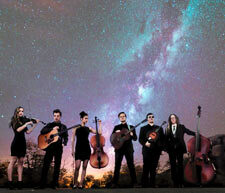 The young sextet, ranging in age from 17-21, has since developed a unique style, playing a blend of new old-time, contemporary bluegrass and indie-folk music. In addition to a bevy of spirited originals, the band’s repertoire spans many genres, including songs from artists like Bill Monroe, Robert Johnson, and even AC/DC. Sugar & The Mint’s first album, Grape Flavored, is available for purchase or streaming on iTunes, Spotify, Amazon, YouTube and of course SugarAndTheMint.com.